Enjoy giving an original hand-painted ornament this Christmas! Perfect for the holiday season, this 4" Square Ornament is personalized and individually hand-finished with a Family Name and the year. A personalized ornament is cherished year after year and makes a great "early Christmas gift" for the family to enjoy. 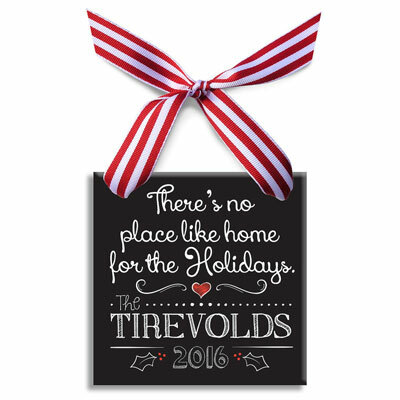 This original artwork is heat-sealed into each tile, ensuring a high-quality finish and a long lasting holiday keepsake. The personalized Christmas ornament comes with a coordinating ribbon, already assembled and ready to hang on the tree! 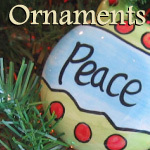 The ornament is a one of a kind... handpainted and personalized in the US just for you. Made of a 4" x 4" flat ceramic tile. Understandably, personalized items cannot be accepted for return; however, if your order is not 100% accurate due to our error, you may return it in new condition and in its original packaging for a prompt exchange. All returns must be made within 30 days of receipt. If you have placed an order and realize you need to change or cancel it, updates must be made by the close of the next business day that your order was placed. Each and every ornament is hand-painted and signed by Kathleen Virtue.